Home Page | How does it work? | How to take air samples? Air sampling is necessary for many people in their professional activities. Many working areas demand special attention to the quality of air. Various contaminants, gases, vapors and particulates, can inflict harm to workers at industrial estates, building constructions, chemical productions and many others. There are personal and area air sampling pumps, first are wearable and for personal use of each professional and second ones are to analyze the air quality at the whole or part of working place. The American company Sensidyne manufactures robust and reliable equipment well known all over the world under the brand Gilian. They represent the complete line of air sampling facilities required on market. Together with pumps, Sensidyne produces air-sampling accessories, media and calibrators. Personal sampling with Gilian products is easy and comfortable, as they are lightweight and convenient to wear. They take in air through the filter with a constant speed and make quick and accurate analysis of it. Different tools may have different assignment, control one or various contaminants. The pump is usually attached to the belt of the worker and is connected with the collecting device by tube. The collecting device should be clipped to the clothes in the breathing zone to take the air worker is actually breathing. Before taking air samples the device has to be calibrated. The manufacturer offers calibrator Cilibrator 2 that provide an easy and quick operation. Simply connect the whole unit, pump, filter and collection device, to the calibrator and follow the manual that comes with your tool. GilAir Plus model positioned as One Air Sampling Pump with All the Features You Need and Want. It is compact, samples all kinds of contaminants, and has the widest flow rate, from 20 cc to 5 liter per minute. There are other models offered by the manufacturer to satisfy all needs and budgets. All sampling equipment is certified and approved to operate all over the world. Certifications, among others, are ATEX, UL, CSA, C-US. Gilian AirCon-2 area air sampling pump is a high flow rate equipment to control the hygiene and safety of the working place. 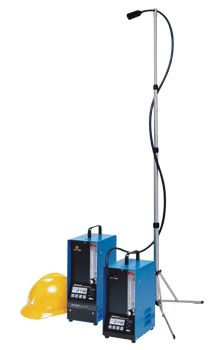 It can take up to 30 liters per minute, it is stationary but provides the accurate and reliable result due to its high capacity. The unit is complemented with the tripod with mast and tube with, the filters for collecting device should be ordered separately. The equipment is provided with the LCD display and touchpad to help programming of AirCon-2. The power supplies are AC or batteries. Both personal and are sampling pumps use the reliable and approved methods of analysis of National Institute for Occupational Safety and Health (NIOSH), Occupational Safety and Health Administration (OSHA) and United States Environmental Protection Agency (EPA). Safety, quality and accuracy are the inherent features of our Sensidyne air sampling facilities.